Many people come to us for pain. Shoulder, back and hip pain are very common. We are huge fans of pain. Not fans of you being in pain, but fans of helping you with pain. Our bodies are made to work, work well, and work for a long time. However there are many positions and habits culturally that are causing pain. Two areas that are the cause of pain are in the category of muscle imbalance syndromes. 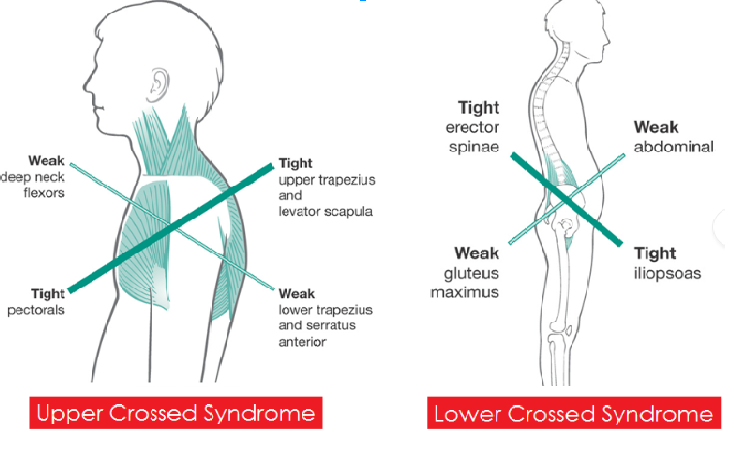 These are Upper Crossed and Lower Crossed Syndrome. Although these terms are “household names” in the physical therapy world, the terms the textbooks use to describe them don’t mean much to the average person, so we are going to unpack them each in a way that will help you understand the ways in which your movement habits may be putting you at risk for injury and pain, causing your pain, and how rehab exercises and chiropractic care can help you correct these imbalances. In general, muscle movements require balance of the muscle length and strength to create tension in the correct way for muscles to move as they were designed and therefore joints to move as they were designed. Most imbalances causing musculoskeletal pain are muscles surrounding joints. When these muscles around joints are compromised, joint pain occurs. Biomechanical imbalances from repeated movements in one direction or sustained poor posture. The weakness and tightness associated with these muscles is what causes Lower and Upper Crossed Syndromes. This is tightness in the upper trapezius and scapula crosses with tightness of pectoralis major and minor. In other words, a weak neck makes tighter/shorter chest muscles. This is where shoulder pain occurs. These areas of tightness and weakness correlate with C4-C5 and T4-T5 segments in the spine. How does this develop? The overuse of the trapezius muscles are often the main culprit. This overuse is chronic since majority of us work at desks, sit the majority of the day and exhibit poor posture. Each of these put added strain on the upper back across the shoulders causing imbalances and compensations in the neck and shoulder areas. 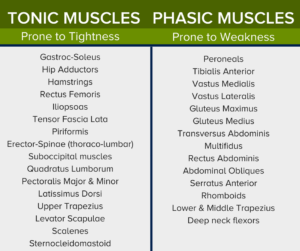 Damage occurs over time with overuse as the body compensates for the tight/weak muscles and turns off other muscle groups and movements that should be moving in the natural biomechanics. This causes other areas of weaker muscles. This is similar to Upper Crossed, but as expected, in the lower quadrants of the body. Essentially, tightness in the lower back makes for weak gluteus maximus (rear end) and hips and vice versa that weak rear end makes for tight lower back. This is a major player in lower back pain. It is often not an injury causing lower back pain but rather biomechanical imbalances that cause pain and over time crease injury. Lower Crossed Syndrome correlates with L4-L5 segments with SI and hip joints. Lower Crossed Syndrome looks like an excessive lower back arch and forward tilting pelvis. This feels like lower back pain and/or hip/pelvic dysfunction. There can be an outward leg rotation and knee hyperextension with this combination of week hips and tight spine. Desk jobs, communication and even recreation all depend on stationary devices, often handheld. The devices used for virtually every area of life (work and play) require the head and neck to tilt down causing and/or contributing to the Upper Crossed Syndrome. Rarely do computers actually get raised to eye level allowing the neck to remain neutral. Furthermore, the chronic sitting required for most desk jobs increase the tightening of the hips and weakening of the lower back. Standing desks can help mitigate this damage, but they are not a replacement for actually moving your body. The correlations of these syndromes (both Upper and Lower) to the cervical spine means that chiropractic care can help align the muscles and joints to help correct the improper curvatures from prolonged improper movements and posture. However, chiropractic care along will not fully correct the issue as they are rooted in weak and tight muscles. Rehab work and home exercises must also accompany the chiropractic correction to truly restore the appropriate use and function of these muscle groups and improve/prevent pain. The improper use of these muscles groups and therefore the pain and injury they incur has developed over years of sitting, desk work, devices and poor posture. One visit to the chiropractor will help with your pain, but will not correct it since the muscles will still have the same tightness and weakness issues. Just as it developed over time, the muscles need to be stretched and strengthened (retrained) over time. LifeWorks Integrative Health has both the chiropractic team and rehab team to fully assess and treat your Crossed Syndrome pain and injuries. Although your pain may have taken time to develop, there are solutions that can get you out of pain and keep you out of pain. LifeWorks Integrative Health is your way forward to the health you need for the life you want.